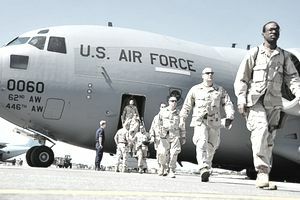 The needs of the Air Force Stressed List are determined by jobs in the Air Force that need filling with recruits, more senior airmen, or officers as well. As of 2017, there were 50 jobs in the Air Force that were listed on the Stressed List. Many consider this a tool for the recruiters to help fill and guide qualified recruiters toward these jobs that are most needed in the Air Force. Searching the publicized list before visiting the recruiter can help a future recruiter toward being selected if your job wish list is on the Stress List. The most stressing shortfall for the Air Force is the pilot under-manning issues that now, as of 2017, tops 2,000 pilots. The Air Force needs so many pilots that they are considering new programs that allow senior enlisted airmen to attend flight school. Also, a consideration is to create a warrant officer pilot program similar to the Army pilot program to fill this backlog. Every three months, the Air Force examines all of its enlisted and commissioned officer jobs to determine which jobs are the most in demand and most understaffed. All jobs are given what's called a "stress rating," and those with the highest ratings are placed on the "stressed list." Stress, as defined here, is driven by three main factors: manpower, manning, and deployments. Drivers of stress are different for each career field, but when a career field is considered "stressed," that means the Air Force doesn't have enough personnel in that particular career field. Assigning stress levels to jobs provides Air Force leadership with an objective, single measure to determine relative stress between different Air Force Specialty Codes, which are used to designate each job. The Air Force has a goal of trying to achieve a "stress level" of 1.2 or less for each Air Force Specialty Code. Air Force Jobs in Demand, or Not? Even if a job has a high-stress code, meaning it's considered undermanned, that does not necessarily mean the job has openings for recruits (although a job's presence on the list also could indicate a need for recruits). For example, the job may be adequately manned in the first-termer (recruit) ranks, but considered "stressed" because of a shortage in the Noncommissioned Officer (NCO) ranks. In that event, the Air Force would try and correct the shortage through the NCO Re-Training Program. Even if the "stress" is caused (or partially caused) by a shortage of personnel in the first-termer ranks, available training seats can come into play. For example, Air Force technical schools can train only a limited number of students at any given time, and all the projected "training slots" may already be filled by people already in the Delayed Enlistment Program (DEP), or already in the Air Force, but awaiting a training slot. Increasing the number of training slots available at the recruiting centers is generally not a viable option. Adding more slots means adding more resources. More instructors must be added (thereby removing experienced NCOs from the "field"), dormitory space would need to be added, more support personnel (finance, administration, and personnel), would need to be increased, and dining halls expanded.